Ambassadors, almost by definition, represent the interests of a specific sovereign state. But Ambassador David O’Sullivan represents 28 countries, or rather, the European Union in which they are all members. In February, shortly before leaving Washington, he sat down with Diplomatic Connections for a look back at his action-packed four years as head of the EU Delegation in our nation’s capital. During his tenure, the Irish-born EU senior career diplomat successfully helped to lobby the U.S. Congress to ratify the landmark Iran nuclear deal in 2015 – but three years later failed to persuade the Trump administration not to withdraw from the agreement. O’Sullivan also coordinated the European Union ambassadors’ diplomatic pushback when the Trump administration slapped tariffs on European steel and aluminum. The EU promptly retaliated with what O’Sullivan called “rebalancing” tariffs on a number of U.S. exports to Europe, including whiskey, peanut butter, and motorcycles. As part of the diplomatic campaign, O’Sullivan organized a video in which all 28 European ambassadors, plus himself, argued in favor of free trade between the U.S. and the European Union. Announced U.S tariffs on European automobiles were put on hold pending further negotiations following a meeting between EU Commission President Jean-Claude Junker and President Trump. To counter the administration’s recent charges that Europe has long taken advantage of the U.S. in bilateral trade, Ambassador O’Sullivan argues that, while the U.S. has a deficit in bilateral trade in goods, the gap closes when bilateral trade in services and primary income (income from U.S. investments in Europe) are included. Ambassador O’Sullivan says his greatest disappointment was the failure of TTIP (Transatlantic Trade and Investment Partnership), the proposed massive U.S.-EU trade pact, which, after lengthy negotiations mostly while he was ambassador in Washington, has now been dropped. The ambassador, who had a key role in creating the EU’s External Action Service, or department of foreign affairs, said he would be “retiring after 40 years of European public service, and going back to Brussels, where I spent most of my professional life.” He is succeeded by Ambassador Stavros Lambrinidis, most recently the EU Special Representative for Human Rights, and earlier foreign minister of Greece. Diplomatic Connections: The head of the European delegation seems to have two jobs. One is representing the EU’s interests, but the other is organizing and coordinating the 28 EU ambassadors to deal with community issues. Is that correct? Ambassador O’Sullivan: It’s one job really. I’m the European ambassador in Washington to the United States, so that means it’s my responsibility to represent the interests of the EU here and to report back to Brussels on developments in the United States which are of relevance to the European Union. An integral part of doing that is working with our member states. The difference between a unilateral ambassador and someone who represents the interests of 28 member states is making sure that my fellow ambassadors are fully briefed and informed about what we’re doing – that they understood what things were coming up in their context, and that we do this extensively right through the whole level of the embassies. I chair a monthly breakfast, then my deputy chairs the deputies once a week, and then various specific trade counsellors and financial counsellors meet very regularly with different degrees of intensity and function, depending on the nature of the issues. Diplomatic Connections: In this context, you must be the only ambassador in Washington who has ever produced a video featuring 28 ambassadors, each one stressing the virtues of free trade. Ambassador O’Sullivan: I think it is a first. We wanted to send a clear message about the importance of trade between the European Union and the United States for both countries, and the extent to which both sides benefit from the existing trade and investment relationship, and it is imperative to underline that this was not just the European Union ambassador saying this, but was, indeed, something felt by each of our member states. We did an op-ed which we all signed, and that was a somewhat traditional vehicle, but it was also, I think, the first or second time anywhere in the world that we had produced something signed by all 29 of us (ambassadors), and then Kasper (Zeuthen, EU senior press and media officer, Washington, D.C.) had this idea of the video, which was a slightly more updated, social media friendly type gesture. Diplomatic Connections: Was it difficult to persuade all 28 ambassadors to take part in this? Ambassador O’Sullivan: Not difficult at all, I have to say. People immediately bought into the idea, and everyone was very supportive. We produced it in rapid time and the script was sent to each ambassador, everyone was asked to film themselves, they sent us the (individual) videos, and we put it together. Diplomatic Connections: What was the impact of the video? Ambassador O’Sullivan: I hope it sent a clear message, first of the unity of the 28 member states in support of free trade, and in opposing new tariffs and new restrictions. We tried to do that in as user friendly a way as possible to make sure that message gets out there. And I think it had an impact. Diplomatic Connections: Was the ongoing tariff issue the most important issue which you had to confront in your four years in Washington? Ambassador O’Sullivan: My focus is — the issues which are of direct responsibility to the European Union, so obviously trade is the foremost of that, but there are a wide range of other concerns. For example, climate change is an issue of the European Union, the digital agenda, dealing with when the European Court of Justice struck down the safe harbor arrangement for data transfer and we had to put in place a new arrangement, now called the privacy shield, the introduction of the General Data Protection Regulation (GDPR) which gave rise to some debate here. Certainly, a number of foreign policy issues, the Iran (nuclear) deal, the success of the deal and getting the administration to get that through. We did a lot of work with my British, French, and German colleagues up on the Hill. And then, when the (Trump) administration announced that they were thinking of leaving, we worked hard to try and avoid that, not successfully, I’m afraid. Also the issue of sanctions, which is a European Union competence, both with Iran, and with Russia. Diplomatic Connections: What’s the situation with the tariffs now? The U.S. steel and aluminum tariffs are in place, as are the EU retaliatory tariffs. Then there’s Section 232, the Commerce Department report on tariffs on foreign automobiles, which has been submitted to the president, who has 90 days to act on it. Yet the proposal to impose tariffs on foreign automobiles is opposed by the U.S. automobile industry. Ambassador O’Sullivan: I think it’s significant enough to recall that this use of Section 232, which is the national security exception and is a legitimate exception under the WTO (World Trade Organization) rules, in our view, should be interpreted very narrowly and limited to situations of genuine threats of national security - terrorism, war or conflict of some kind. We don’t accept that it is valid to use it, either for the steel and aluminum tariffs or for the automobile tariffs. On the steel and aluminum the decision was taken, the EU put in place rebalancing tariffs, and we have taken the case to the WTO to challenge the use of this section. Then, the administration launched an investigation into whether this could be used for automobiles and auto parts, threatening to become a further conflict. President (Jean-Claude) Junker of the European Commission came here in July of last year, and had a very productive meeting with President Trump in the White House. We agreed to a standstill: the steel and aluminum tariffs would remain in place so we would discuss how they might be removed. We also agreed that while we were discussing the agenda there would be no further tariffs imposed by either side. That agenda covered four points: first, a possible free trade agreement focused on industrial products, secondly, military issues. For example, we’ve just taken action for the recognition of American conformity assessment bodies to certify products for the European market. Thirdly, the specific issue of the sale of liquid natural gas (LNG) and soya beans – soya bean sales to the European Union have increased massively, and we’ve just agreed that American soya beans can be certified for use in the European Union as biofuels, which they were not previously, and fourthly, an agenda of cooperation in WTO reform. They agreed that as long as conversation on those four pillars is ongoing, there will be no new tariffs introduced by either side. So that’s where we are: the working group created to take this discussion forward has met on several occasions, those talks are progressing satisfactorily, and in the spirit of the agreement, it is assumed there will be no new tariffs introduced by either side. Diplomatic Connections: During Junker’s visit -- was there any issue actually averted? Ambassador O’Sullivan: At that point, the issue was car tariffs because of the (Section 232) investigation that was ongoing. One of the results of that meeting was an understanding that no such new tariff would be introduced while we were continuing our negotiations. As far as we’re concerned, that situation still prevails. Diplomatic Connections: In your travels in the United States, did you get a sense that anyone in the American heartland has the faintest idea what the EU is all about? Ambassador O’Sullivan: I would not imply that the people in the American heartland are intimately familiar with the institutional intricacies of the European Union. I do find that many people say, it’s a great peace project – you’ve had the longest period of peace in Europe in several thousand years. I believe there is a recognition that the European Union and European integration have changed the nature of living on the continent, and depending on who you talk to, if they do business in Europe, they understand that you now have a single market of 500 million people, rather than having to try selling to 28 separate markets, and people are aware of the benefits of being able to travel around Europe much more freely than was the case before. I don’t think people fully get the precise constitutional balance between the role of member states, the commission, and the (European) parliament, but I found a great deal of knowledge and understanding about the core principles of the European Union. Diplomatic Connections: Have you had any reaction from trade groups impacted by the retaliatory EU tariffs? Diplomatic Connections: Is that why the automobile industry in this country is worried? Ambassador O’Sullivan: Extremely worried. People ask me, would Europe be worried if there were going to be tariffs on autos and auto parts? The answer is, we would be, but frankly, the first people to worry should be the American people. This would have a very negative effect on the U.S. auto industry, and in particular the related industries, such as dealerships. I’ve seen estimates of possible job losses running into hundreds of thousands here in the United States as a result of these tariffs. There are concerns on our side, of course, because it would hit our exports; but to be direct, if I were an American, I would be worried about what this might do to my domestic economy. Diplomatic Connections: How does the new U.S. approach to tariffs fit into the overall bilateral trade picture? Ambassador O’Sullivan: The European Union is a fair trading bloc. We are one of the most open economies in the world. Our average tariffs are very similar to those of the United States. We are a major importer, and a major exporter, and if you take the main indices of balanced trade, which is trading goods, it is true that the United States has a deficit of $150 billion; in trading services the U.S. has a surplus of $50 billion. And then, if you look at primary income, which is the income earned by American companies invested in Europe, and income earned by European companies invested in the U.S., the U.S. has a surplus of $100 billion, and those three numbers add up to zero on both sides, which to me shows that this is actually a very fair and balanced relationship. Diplomatic Connections: Over the past four years, have you seen much change in the mood of the country, and in the outlook of Americans? Ambassador O’Sullivan: I often think Americans underestimate the extent to which Europe is now integrated: they still think of us as separate countries. Perhaps not everyone understands how integrated the European Union has become. How easy it is to move. There’s recognition of professions: For example, if you’re a doctor, you can practice anywhere. We’re probably more advanced in this than they are in the United States. Equally, on the European side, we tend to underestimate the diversity of this country. We tend to think of America as homogenous, and it’s not. It’s always been an extremely diverse country, not just ethnically and culturally but in terms of outlook. California is very different from New York, Oregon is very different from Louisiana. These states have their own character and personality, and I think that’s still there, and inevitably, there are different tendencies in American society. There’s the more liberal as well as the more conservative, and you see this in the ebb and flow of American politics throughout the years. Different currents of political thought are everywhere in America, you find very isolationist thinking; while conversely, you’ll also find very outward-going and open to the world type of thinking. 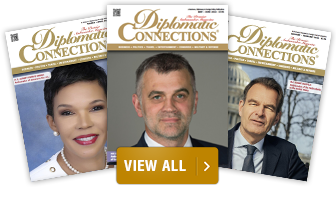 Diplomatic Connections: What would you say to an incoming foreign ambassador who asked you what it was like to operate in this capital? Ambassador O’Sullivan: I would say that it’s a huge honor to be an ambassador in Washington because there is a warm welcome for ambassadors in this city, in the administration, in the Congress: we are very well looked after by the State Department, including all the think tanks and the social events which are here – ambassadors do have privileged access so it’s a fantastic opportunity. Additionally, I would say that, while Washington is wonderful, it’s advisable to get out of Washington, and see as much as you can of the rest of the United States. When we arrived, my wife and I made a conscious decision that we would not take our holidays back in Europe, but we would vacation here. Therefore, we spent all of our summers traveling around this nation, and that’s apart from the official trips that I’ve done all through the year, because this is a wonderful country whose diversity is fascinating and certainly merits being explored. Diplomatic Connections: It’s said of diplomatic postings that the first year is about settling into a new capital, and the last year is preparing for the new assignment. With that in mind, is four years a good length for a foreign posting? Ambassador O’Sullivan: Every diplomatic service has a different practice. There are ambassadors who have been here for seven or eight years, and some who’ve been here even longer. That’s their national choice. Most of the European services do have a time-limited period. For the European External Action Service, it’s four years because we want to have a turnover of individuals and nationalities in this role. What is the best length of being an ambassador (in a capital)? If you’re the incumbent ambassador you will say ten years, but if you’re looking at it from the capital, I would say four years is a good, median time frame for an ambassador to be here - first year to settle in, two-and-a-half years of peak performance, and then the last six months it’s known you’re leaving. When we were setting up the External Action Service how long the posting should be was one of the debates we had, and we settled on four years, which seemed to be the average in other countries. Diplomatic Connections: There is a great deal of speculation about what will happen in the United Kingdom if there is no Brexit settlement. But what about the EU? What happens in Brussels if there is no deal? Ambassador O’Sullivan: No deal is a bad outcome for all of us. A disorderly departure of the U.K. from the EU is going to be deeply disruptive on both sides. I would say much more so for the U.K. than for the rest, but it will also have negative consequences (in the EU). That’s why the European Union has been working very assiduously, that’s why we have made many concessions to British concerns in order to agree on the deal which was signed with (Prime Minister) Mrs. (Theresa) May at the end of November. We confidently expected – because the British government told us – that this was what they needed in order to have it approved. This has not worked, and there are considerable difficulties at Westminster. Diplomatic Connections: What does a disorderly disruption mean to the EU? Ambassador O’Sullivan: Hopefully we won’t get there, so it’s not a scenario that anyone is working toward. But it would mean a disruption of the frontier where there would have to be checks, long lines of lorries (trucks), air transport and planes being able to fly are issues of concern. Recognition of products – medical products – fresh food being transported will be given extra attention because you go into a kind of legal vacuum. At the present time, there is seamless movement of people, goods, services, and capital between the U.K. and the rest of Europe which is indispensable to the business cycle to supplying supermarket shelves and pharmacies; but from one day to the next, you go into a complete legal vacuum, and no legal framework exists for trade between us (outside the EU). People say you go to the WTO (World Trade Organization), but you can’t because the U.K. hasn’t got a WTO schedule (access to the WTO: the EU has one schedule covering all its members); they have to create their own schedule. A huge amount of disruption and legal uncertainty would ensue, and it would have very serious ramifications for the U.K. It will also have unhelpful consequences for the rest of us, and that is why we’re doing everything we can to avoid that situation. Diplomatic Connections: What has been the overall impact of Brexit within the European Union? Ambassador O’Sullivan: The British situation has always been a little sui generis in Europe. If ever there was a country where the idea of leaving might gain traction it was probably the U.K. I don’t see a similar level of unhappiness with European Union membership in any other country, and paradoxically, these days support for the European Union in all our member states is running very high. Diplomatic Connections: But is that a paradox, or a result of the confusion of Brexit? Ambassador O’Sullivan: You can never tell how linked it is – the cause and effect of these things. But what I observed is that we had very strong levels of support for the European Union and European integration in all our member states. And interestingly, a number of the populist, disruptive parties across Europe are actually, discreetly dropping from their manifestos any reference to leaving the EU or leaving the euro, because I think they’ve understood that this is actually not a vote getter, but on the contrary, it might make them less credible to the voter. This doesn’t mean that everyone loves Brussels, or everyone is perfectly happy with the European Union, of course. I often say that Brussels is held with the same respect in the rest of Europe as Washington is in the rest of America. Everyone loves to blame the central government for everything that goes wrong. So there is criticism of Brussels, of the European Union, but I think at heart people do understand the enormous benefits which this has bought them. Diplomatic Connections: There have been quite a few senior Americans visiting Europe in the past few weeks, many of them in Eastern Europe, up to, and including Vice-President Pence, and Secretary of State Pompeo. Would this be an attempt to encourage division in the EU by influencing more combative member states with populist governments? Ambassador O’Sullivan: The nature of the EU is such that the Americans will always want to have good contacts with the European institutions in the EU, but also with individual countries. And that’s been the case for ever, and will continue to be. The American friends, like other partners, are also quite good at making their case to individual countries about what the EU is doing, this is normal. It’s up to the Europeans to decide whether they want to be divided, or whether they want to maintain the united front. There’s nothing to stop one of our partners from wanting to make their positions known not only at the level of Brussels, but also at the level of member states, and then we take that into our council when we get together as EU, and we decide what is best for Europe. But it’s quite normal that we would include in that reflection of what is best for Europe some understanding of what our American friends and allies think. Diplomatic Connections: What is your greatest disappointment at not having succeeded in completing one specific project in your time here? Ambassador O’Sullivan: I will always regret that we never managed to bring the trade negotiations TTIP (Transatlantic Trade and Investment Partnership) to a successful conclusion. We ran out of time. If we had started a little earlier we might have gotten it done. I think it would have been a huge step forward, but that moment has passed. We will find other ways of taking forward the economic and trade relationship, but I will always nurture a small regret that it didn’t happen under my aegis. 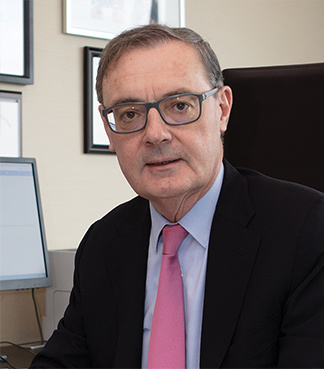 Ambassador O'Sullivan, who in the interview said he was going to retire, has since been appointed Special Adviser to the President of the European Commission on EU-U.S. relations.